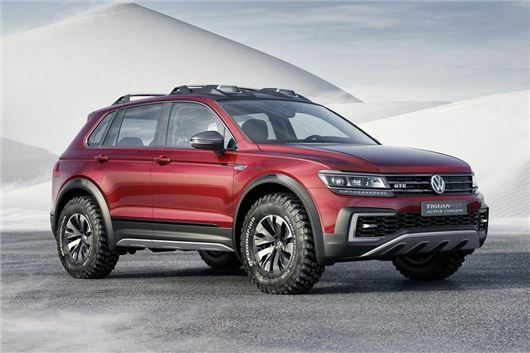 Volkswagen has premiered the Tiguan GTE Active Concept at the 2016 Detroit Motor Show. Powered by two electric motors and a petrol engine, the all-wheel drive Tiguan has peak power of 225PS, official economy of 75MPG (on the US test cycle) and can cover up to 20 miles on electric power alone. It's expected to make production before the end of the year, but with less exciting styling. All four wheels can be driven by electric motors, either when a loss of traction is detected or when the driver selects four-wheel drive mode manually. By default, when the car is in electric mode the rear wheels are driven. The 1.4-litre TSI engine will kick in to provide additional torque when needed, or when the battery is depleted it drives the front wheels alone. Transmission is a six-speed DSG automatic. The concept car has chunky off-road styling, including knobbly tyres, under-engine protection, roof-mounted LED spotlights and plastic wheel arch cladding, slong with raised suspension. Volkswagen says it could feasibly fit these accessories to a production Tiguan, however it’s unlikely the production GTE will look much different from other variants, meaning on-road focused styling and wheels. The Tiguan GTE Concept is fitted with Volkswagen’s next-generation infotainment system. The 9.2-inch touchscreen features up-to-date phone connectivity, including Android Auto and Apple CarPlay functionality. It also features gesture control, meaning the driver or passenger can control functions without touching the screen, simply by moving their hands in the right way.